For this 2014 edition the chart has been fully updated throughout. 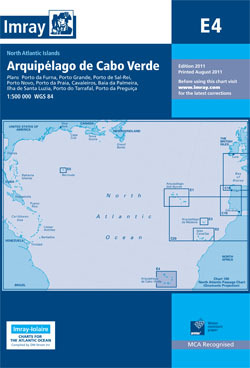 Completed harbour developments are shown at Port Novo (Ilha de Santo Antão), Porto de Sal-Rei (Ilha de Boavista), Porto de Praia (Ilha de Santiago) and Cavaleiros (Ilha de Fogo). The sketch plans of Porto Novo, Porto de Tarrafal and Porto da Furna have been replaced by fully georeferenced WGS84-compatible plans. Revised depths have been applied and positional accuracy improved throughout.